The panel is ON by default. 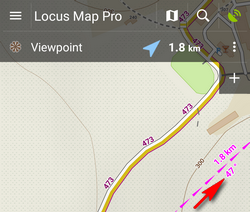 Sets the distance at which Locus Map switches guidance to a next following routepoint. Settings of type of alert of approaching direction change - beep, sound or TTS. Notifies user of leaving the route. Tapping the item displays a dialog to set the alert distance, notification repetition and sound settings. Settings are the same as for Navigation. Strict route following - depending on the route shape Locus Map automatically selects routepoints that are closer than the pre-set distance. This option switches this automation off and Locus guides along the track strictly from point to point - suitable e.g. for sailing. 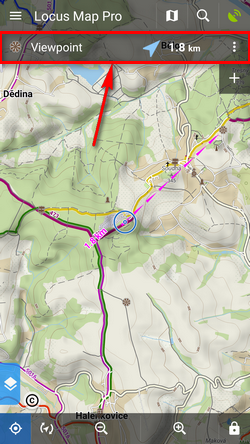 Notify on every routepoint - starts continuous notification of accurate following the track. 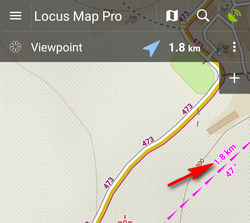 Applies only for tracks without navigation waypoints, e.g. when sailing, flying or sea-kayaking.